In today's world, there are millions of forgotten children who have never experienced “opportunity or hope”. 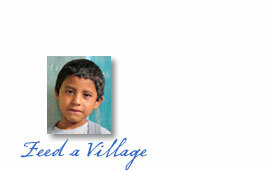 Our foundation was established to help improve the lives of children ravaged by conditions of extreme poverty. Our goal is to instill the desire and provide the necessary tools for them to become self-sufficient, caring, and responsible adults. 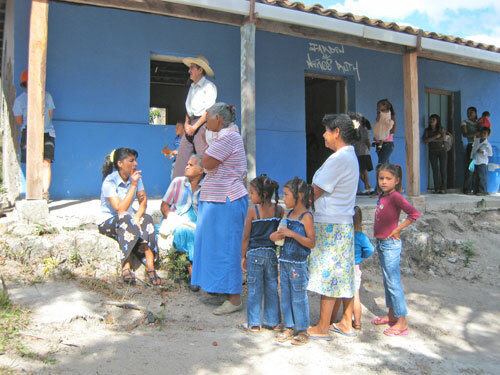 We work directly with the rural elementary schools in these remote Honduran villages. Click this button to Help provide vitamins, toothbrushes, and school supplies to over 600 children and donate today to Zoe and Ivy’s "Hearts for the Arts" campaign. Children and families living tucked away in remote villages are testimony that you need very little to make a happy life. They are impoverished, isolated and for the most part, they are forgotten. 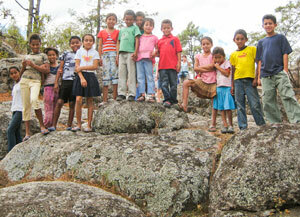 The average Honduran family has eight children. Education is mandatory until grade six but each student is required to have a $30 uniform, making education impossible for most families. Children often expect their only meal of the day to be served at school. However, in remote villages the cupboards are often empty. Our mission is to inspire people and provide them the tools to become self-sufficient responsible adults. H4HC is a small 501c3 foundation with no “middle men” and no marketing budgets. We are volunteers working to ensure all funding is allocated, delivered and monitored. We work to instill hope, dreams, independence, and leadership. We believe in helping provide the essentials of food, water, and education. We encourage and inspire people to help themselves while we work for sustainable long-term success. Hidden in the mountains surrounding Tegucigalpa we were thrilled, blessed and grateful to find a large school for desperately underserved children. San Juan de Rancho serves 250 children from Kindergarten through 9th grade. We were stunned to learn that many of these students walk over two hours each morning to attend class. We were equally stunned to learn that not one of the children had the economic backing to own a toothbrush or toothpaste. But, they are exceptionally eager to learn and appreciative of any support we can give them! It is always a challenge to reach this small village and virtually impossible during the rainy season. However, crossing the rivers and trekking up the twisted mountain road is always worth every bit of the effort. 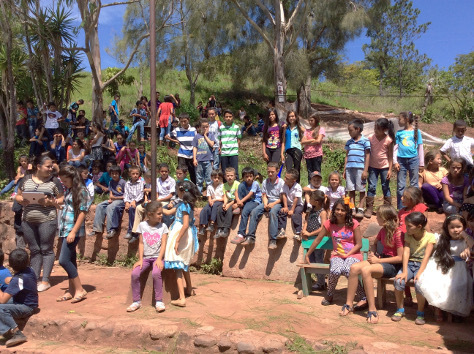 When we first arrived in Naguara in 2010, the children had not even heard of the USA…. today they are aiming to attend high school! When they hear our bus approaching the children run to greet us with gleeful screams of “Welcome”. Because of their very remote location, the need for food and educational materials is critical. 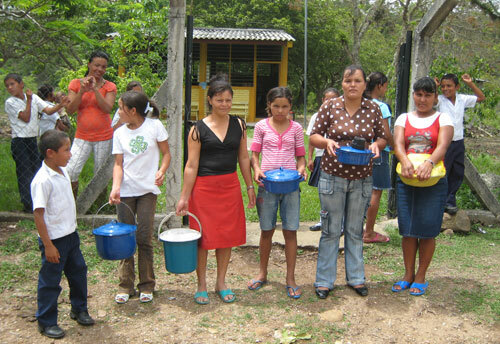 The village of El Campo, is home to approximately 320 people. Although there is electricity and potable water, the community is extremely poor and most are unemployed. In the three-room schoolhouse there is one paid teacher and three volunteers. As in most rural villages, more often than not, siblings will share shoes and one school uniform. School supplies, uniforms, shoes, toiletries and vitamins are far beyond the capability of most families. 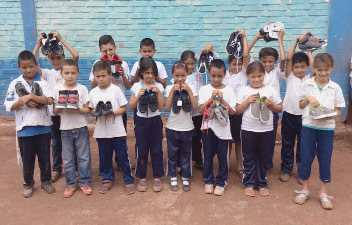 In some families the children attend school on a rotating basis with the shoes and uniform. In addition, the child who attends school hopes to receive their only meal of the day. We make every effort to make certain the cupboard is never bare. The food is lovingly prepared by a thirty year old mother of three, Lucia. She is deaf, unable to speak and due to the lack of education, Lucia does not read. 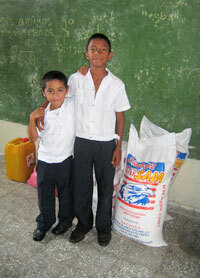 Again, our objective is to help support El Campo with food and educational materials. Just 2 hours from Tegucigalpa, this remote village is home to approximately 260 people. It began with ten straw huts in 1920 but in 1933 due to the ravages of yellow fever the villagers moved to higher more remote ground in order to avoid the disease and live in fresher air. In Flor Azul village life is simple but not easy. It is extremely difficult to drive to the village necessitating a journey through sugar cane fields and up a twisted rocky dirt road. There is no electricity and no water. Due to its mountainside location, extreme droughts followed by horrendous floods, the growing of crops is all but impossible. Only a handful of the men have employment and that is only temporary during the cane-picking season. But look closely and you will find a tight knit, happy and grateful community. When the sun sets at six o’clock families gather, light a candle, eat tortillas, sing songs and share stories. They believe the future of the village rests on the education of their children, the funding of which is their greatest challenge. There are many extremely impoverished villages tucked high in the mountains near Copan Ruinas. Education, medical care, and clean water are our priorities as we expand our programs and work to effect sustainable change.